Heritage American tennis brand K•Swiss is partnering with renowned DJ, producer and entrepreneur Diplo to launch ‘The Board’, a game changing campaign built to inspire, and to be led by, the next generation of young entrepreneurs. Appointing Diplo is a nod to the brand’s founders, two entrepreneurs who moved to California in 1966 and built the global brand from a revolutionary tennis shoe, the K•Swiss Classic. Diplo will serve as the Director of a 100-person board comprised of creative and connected individuals who will work on real tasks to bring the K•Swiss brand back to prominence. The application site will open today with submissions valid through April 30, 2015 at www.kswiss.com/theboard. Led by Diplo, successful applicants to ‘The Board’ will be invited to the program’s members-only website with a six-course curriculum connecting the group with industry insiders. Each insider will lead a discussion session specific to their expertise, and then assign a task to the board that relates to K•Swiss’ business. Members of ‘The Board’ will make real decisions on real projects that K•Swiss will follow. The program will highlight important topics, including: brand positioning, sneaker design, social media promotion and drafting a business plan. 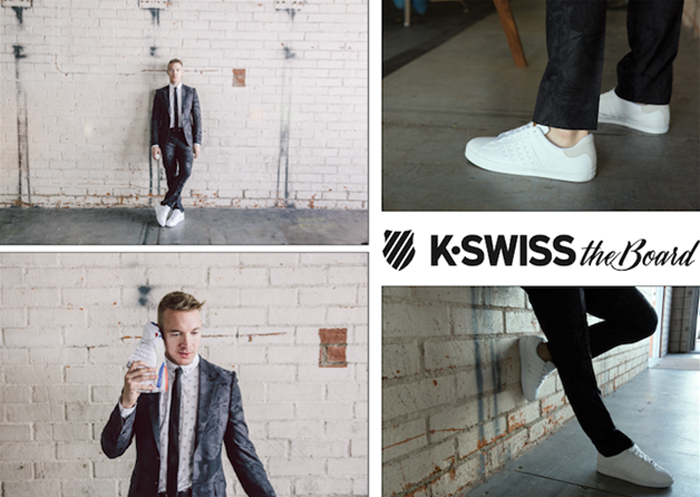 "I was instantly drawn to the K-Swiss brand due to their heritage and longevity in the marketplace,” said Diplo. “I am excited to be part of ‘The Board’, to bring young entrepreneurial minds into the process to help build the next chapter at such a respected brand." ‘The Board’ application period is now open online here. Entries close on April 30, 2015 at 11:59 PM PST. Follow Diplo and ‘The Board’ online at www.kswiss.com and through social media via #ourkswiss and #theboard.